a pumping rate of 8,000 liters per second, water level dropped to almost 44 feet below the surface. BUT WHEN THE PUMPING WAS STOPPED, the level immediately elevated again to 13 feet after 11 minutes. 8,000 liters per second means that 8,000 x 60 = 480,000 liters per minute 480,000 liters per minutes means 480,000 x 60 = 28.8 Million liters per hour 28.8 Million liters per hour means 28,800,000 x 24 = 691.2 Million liters per day. 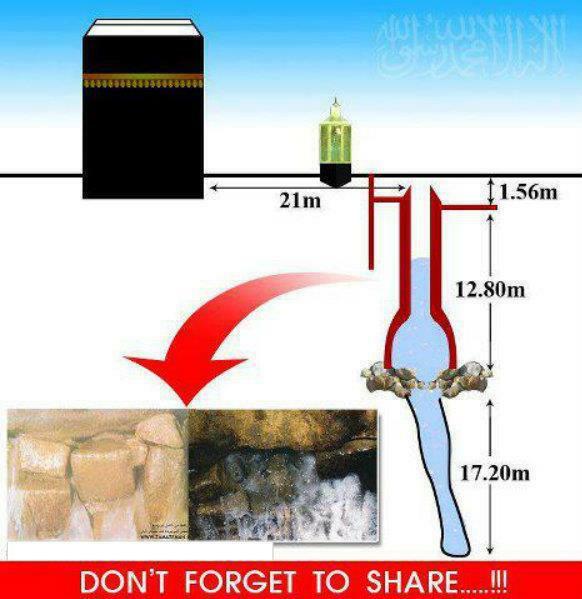 * The Second is that ALLAH Holds the Extra-ordinarily powerful Aquifer for not throwing extra ZamZam out of the well, Otherwise the world will SINK. means Stop !!!!!!!!!!!! Stop !!!!!!!!!!!!!!! Said by Hajirah Alaih As Salaam. bridle or noseband & it is used / pulled to stop the running animal. Zamzam water has no colour or smell, but it has a distinct taste.